Tamron's "Widen Your Horizons" Competition - Win $70,000 in Prizes! Tamron Australia has launched some awesome new competitions around the theme "Widen Your Horizons" where you can get the chance to share in prizes valued at over $70,000, including a 17-day Vietnam Adventure for two! The theme is all about travel, and with the Tamron AF 18-270mm PZD lens being one of the most popular all-in-one zooms for the photo traveller, Tamron are highlighting their other excellent wide-angle zoom lens that is very popular for travel photography: the Tamron 10-24mm. 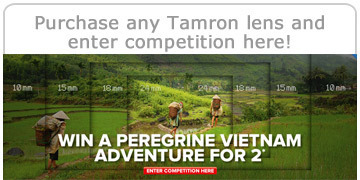 To enter the draw for the Peregrine Vietnam Adventure for 2 simply purchase any Tamron Lens from us and then enter the competition here. There are also "cash-off" consolation prizes to be won weekly. And if that wasn't enough, there's a Photo Competition where you can be in the running to win "The Ultimate Camera Gear Travel Kit". You want more, you say? Well by entering the photo comp you can also be in the race to score yourself a fantastic Tamron 10-24mm wide-angle lens - winners are chosen fortnightly. Plus there are also "cash-off" consolation prizes. The competition started on Friday 6th July 2012 and runs until Monday 3rd September 2012. For further information and terms and conditions jump on over to Tamron Australia. Everything is Comin' Up Nikon!